Not far away from second half. Great opening 45 minutes. Will it continue? The teams come out for the second half. Sergio Agüero has come on for Ezequiel Lavezzi. 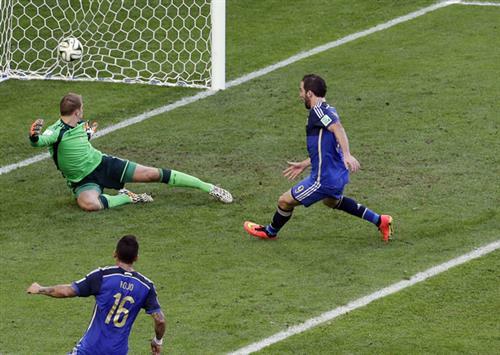 And an early chance for Argentina as they get into the German box but Higuain offside. Messi just fires a shot wide. Wow. Inside the box, left footed but slides it past the goalpost. 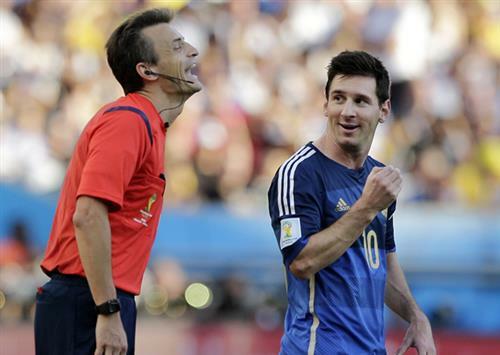 Another decent chance there for Argentina and this time Messi the one to miss. Germany camped in their own half and get over halfway before turning the ball over. For a third straight time the World Cup final is set to go into extratime. Three minutes of injury time to be played. Mario Gotze with a long distance strike but not enough on it and it rolls straight to Romero. But Agüero can't get a cross in as Hummels makes the tackle. So 30 minutes more. The last time Germany went to extra-time in a World Cup final was 1966 at Wembley. At least we have goalline technology now. Match stats for the 90 mins. First half of extra-time underway. André Schürrle with a shot inside the box but straight at Romero. Wow. That could have been the lead right there. He fell over, got back on his feet to receive the ball and fire in the shot, just couldn't get it past Romero. Germany back on attack now. Schweinsteiger with cross but Argentina clear then break. Sergio Agüero with a shot across the face of goal. No one with him though and Germany clear. Fast-paced start to extra-time. Both teams out to win the game. Great to see. Kroos with a searching low pass into the box but can't find a teammate. Argentina clear. Gotze tries to chase down a ball but it goes over the touchline. Rodrigo Palacio with a chance inside the box but can't get a clear shot away. From his chest the ball was bouncing and he tried to chip Neuer but couldn't find the back of the net. Gaps opening up in both sides now. Germany enjoying decent territory but Argentina continue to hold strong at the back. Would be an amazing showing to go through 450 minutes in second stage of tournament without giving up a goal. Bastian Schweinsteiger is down. But after a little break he's back up. Javier Mascherano now goes down after clashing ith Toni Kroos in midair. Couple of minutes left in first half of extra time. Lahm down the righthand side tries to find Kroos on edge of box but Argentina clear. Argentina break but Germany get freekick as Palacio fouls Lahm. And that is halftime of extra time. Down the lefthand touch, Schürrle with the cross. Gotze takes it off his chest and puts it past Romero with his left foot. What a cracking goal. The first time Argentina have been behind at this World Cup. First goal conceded in the second stage of the tournament. Just five minutes left now. Germany about to claim a fourth World Cup title. That goal is worth winning a World Cup. Off his chest and left foot volley. Into the final few minutes now.